The Society was incorporated by act of the General Court of the Commonwealth of Massachusetts on October 24, 1812, in response to a petition from Isaiah Thomas and his colleagues that they might establish an organization to "encourage the collection and preservation of the Antiquities of our country, and of curious and valuable productions in Art and Nature [that] have a tendency to enlarge the sphere of human knowledge." Further, they wished to promote the use of such collections in order to "aid the progress of science, to perpetuate the history of moral and political events, and to improve and interest posterity." These objectives still form the basic rationale of our work, which is to collect, organize, and preserve the records of the lives and activities of people who have inhabited this continent. We do so to encourage the study and understanding of the past. Such an activity is valuable to mankind on both secular and religious grounds. We accept that an appreciation of the works of people who came before us is a vital part of a full life. Historical perspective on our lives and times is acquired by a knowledge of the past, thereby giving us a sense of proportion that can be instructive and humbling, hubris being endemic amongst us. As stewards of this portion of the universe, we are bound to treasure God's gifts to us and to pass them on undiminished. Those gifts include a knowledge of the past, an appreciation of the present, and an obligation to the future. In 1813, Thomas instructed his fellow members of the Society in much the same manner: "We cannot obtain a knowledge of those, who are to come after us, nor are we certain what will be the events of future times; as it is in our power, so it should be our duty, to bestow on posterity that, which they cannot give to us, but which they may enlarge and improve, and transmit to those who shall succeed them. It is but paying a debt we owe to our forefathers." The Society was established at a time when all historians were "amateurs" of history. The members of AAS through most of its first century were the sort of amateur gentleman-scholar that Thomas was. As scholarship became professionalized, AAS took on that shape as well. Thus, through much of its history, AAS has been the kind of institution where both the amateurs and professors of history have collaborated and contributed to the gathering and dissemination of historical knowledge. The Society still attempts to provide resources, services, and programs that make the history of our nation interesting, pleasurable, and meaningful to as broad a constituency as possible. The course of the Society was set by the founder, a printer and publisher, a book collector, and the historian of his trade. He gave to the Society his collection of approximately 8,000 books, some of which, such as an incunable or two, had little to do with America. His other benefactions to AAS included the first library building, erected in 1820, and the residuum of his estate, which supported the Society for some years after his death in 1831. Beyond these gifts, however, was the intellectual vigor with which he endowed the Society. He sought out members from every part of the Union, who were expected to send printed and archaeological objects for preservation in the library or in the museum. Thus, in 1819, AAS received the Reverend William Bentley's bequest of his manuscripts, books on American history, and prints; Gov. DeWitt Clinton of New York gave the leaden plate buried at the mouth of the Muskingum River in Ohio in 1749 to mark the claims of the French king to the territories of the Ohio Valley; and Charles Wilkins in 1816 sent to Worcester the mummified remains of an Indian woman that were found in a cave in Kentucky. The earliest historical concerns of the Society centered on the evidences of prehistoric life in North America. Thomas painstakingly edited the disjointed thoughts and jumbled manuscript of Caleb Atwater of Circleville, Ohio, describing the Indian mounds in central Ohio for the first volume of our Transactions (1820). It was not until midcentury, after our then-librarian, Samuel Foster Haven, had published the Archaeology of the United States, a volume in the Smithsonian's series "Contributions to Knowledge," that AAS got out of the ethnological business. However, it should be remembered that one of our original charges was to take an interest in the history of the entire Western hemisphere. Effective involvement on such a scale was far beyond the powers of the Society, although a galaxy of prominent Latin American historians and diplomats graced our membership rolls until well into the twentieth century. The interests of Stephen Salisbury III in art (which led to the establishment of the Worcester Art Museum in 1896) and in Latin American archaeology prompted him to sponsor the archaeological expeditions to the Yucatan of Augustus LePlongeon and Edward H. Thompson. Haven lent his full support to these enterprises, and their reports were published in the Proceedings during the last quarter of the century. Following Thomas's death, leadership passed to two successors whose contributions are still evident at the Society. The earlier was Christopher Columbus Baldwin, a high-spirited young man who was rusticated by Harvard College authorities for certain high jinks and who, after brief careers as lawyer and journalist, put his considerable intellect, unbridled enthusiasm, and prodigious energy to the benefit of AAS as librarian from 1827 to 1830 and again from 1832 until 1835. He compiled the several-hundred-page catalogue of the library collections that was issued in 1837. Baldwin was a true bibliophile and antiquary, as he described in his letter to Edward Tuckerman when commenting on the forthcoming marriage of their mutual friend Stephen Salisbury II: "I have instructed myself in the pedigree of his proposed wife, and I can find no fault with it. This is all an Antiquary may lawfully do with young ladies. I am clearly of the opinion that an Antiquary should not pester himself with a wife: he should do nothing that may diminish his affections with venerable books. You know that we cannot serve two masters, much less two mistresses; and my mistress is my profession, for which I have the most solid affection." Baldwin's greatest coup was the securing of the books and pamphlets belonging to Thomas Wallcutt of Boston during five days in August 1834. These treasures, he wrote in his diary, "were put in ancient trunks, bureaus, and chests, baskets, tea chests and old drawers.... The extent of them was altogether beyond my expectations.... Every thing was covered with venerable dust, and as I was under a slated roof and the thermometer at ninety-three, I had a pretty hot time of it.... The value of the rarities I found, however, soon made me forget the heat, and I have never seen such happy moments.... I finished packing my things today and helped load them and start them for Worcester. Their weight was over forty four hundred and seventy six pounds! I cannot but think that it is the most valuable collection of the early productions of New England authors in the country." His unfortunate and untimely death occurred only a year later in a stagecoach accident near Zanesville, Ohio, where he had gone to investigate Indian mounds. It was a sorry loss, indeed, to the Society, for it robbed us of the devotion of a dedicated acquisitor of Americana when only a handful of other institutions were actively collecting such materials. Baldwin was succeeded by the aforementioned Samuel Foster Haven in April of 1838. He directed the affairs of the Society for the next forty-three years. A scholarly librarian possessing a genial nature but a less dramatic personality than Baldwin, Haven was an effective leader of the Society until his retirement in 1881. He edited volumes three and four of the Transactions, as well as the regularly published Proceedings. He did much of the preparation of the second edition of Thomas's History of Printing in America. Haven played a minor role in the establishment of the American Library Association in 1876. He oversaw the construction of the second library building in 1854 and the 1876 addition to it and maintained and substantially increased both the library and museum collections. Haven was ably seconded by Stephen Salisbury II, who served the Society as president from 1854 until 1884. 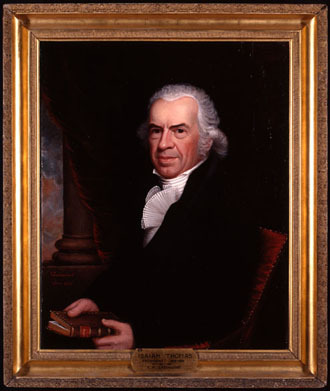 Salisbury was a wealthy Worcester entrepreneur who played an active role in the management of the Society and was generous in its financial support, giving, for example, the funds for the addition to Antiquarian Hall. Also, it was President Salisbury who appointed Mary Robinson Reynolds to the library staff as an aide in 1881 at the time of Mr. Haven's retirement. However, there is one episode that occurred during Haven's tenure that causes pangs of regret to this very day! John James Audubon came to Worcester bearing a letter of introduction dated September 5, 1840, from George Parkman of Boston, addressed to Haven. Audubon called at the library for the purpose of selling to AAS a set of his Birds of America. On Audubon's first visit, Haven was busy and the artist was instructed to return later in the afternoon, which he did. The librarian had departed and Antiquarian Hall was locked up. We have not yet obtained a set of that great book and we despair of ever again having the opportunity of doing so. Haven was followed by Edmund Mills Barton, who had been the assistant librarian since 1866. He served faithfully until 1908 when he retired from an institution that was choking from a plethora of miscellaneous collections and drifting without a clear sense of mission. However, Barton had kept the Society functioning for twenty-seven years, a not inconsiderable achievement at a time when Salisbury was busy establishing the Worcester Art Museum. Following the death of President Stephen Salisbury III in 1905 and Barton's retirement, the Society underwent a dramatic transformation that would see the construction in 1909-10 of the third Antiquarian Hall from the proceeds of Mr. Salisbury's bequest and the dismantling of our museum. The leadership of the Society passed to President Waldo Lincoln in 1907 and to the new librarian, Clarence Saunders Brigham, in 1908. Lincoln was a descendant of founders Levi Lincoln (Jefferson's attorney general) and Gov. Levi Lincoln, Jr. President Lincoln took an intense interest in the Society until he retired in 1927, coming in almost daily to attend to our business affairs. It was he who, with J. Franklin Jameson and William McDonald, led the movement to adopt the stance of a research library, to abandon the museum, and to select Brigham as our librarian. An attorney, Lincoln also was an accomplished book collector and left his American cookbooks to the Society upon his death in 1933. Brigham came to AAS from the Rhode Island Historical Society, where, by the age of thirty, he had already established a reputation as a scholar and bibliographer. Lincoln and Brigham reoriented the Society's activities, reinvigorated our affairs, planned the new building, and reestablished the collecting of early American printed works as our principal goal. With a commitment to Charles Evans to assist in the compilation of his American Bibliography and with a brand new library building to fill up, Brigham set about his task in earnest. In one year, for example, he obtained more than 7,000 imprints issued before 1821. He went after newspapers with a vengeance and in 1913 began publishing in the Proceedings his state-by-state lists that would finally be published in 1947 as the History and Bibliography of American Newspapers, 1690-1820. Brigham invested his life in the Society, for years devoting nearly every waking moment to it and overseeing every detail of its work. He supervised the building of one bookstack wing in 1924 and had much to do with the second in 1950. In 1954 Brigham published Paul Revere's Engravings, a beautifully produced book that gives a complete account of the patriot's artistic endeavors. He retired in April 1959, after fifty-one years of service to the Society, as one of the nation's preeminent bookmen. During his administration, Dr. Charles Lemuel Nichols, a talented book collector and bibliographer, was an active president who succeeded his father-in-law in 1927, and Calvin Coolidge served as AAS president from his retirement from the White House in 1929 until his death in 1933. Samuel Eliot Morison presided over our affairs from 1938 until 1952 and was succeeded by yet another great bookman, Thomas Winthrop Streeter. Brigham himself was president from 1954 until 1959, while still serving as director, to which office he had been appointed in 1930. In 1930 Robert W.G. Vail became librarian. While in office, he completed Sabin's Bibliotheca Americana (volumes 22-29), picking up where Wilberforce Eames of the New York Public Library had left off. When Vail left AAS in 1939 to become librarian of the State of New York (and later of the New-York Historical Society), Clifford Kenyon Shipton was made librarian. Shipton had been one of President Morison's Ph.D. students at Harvard where he had become the college archivist. Shipton retained that office throughout his twenty-seven years at AAS, spending each Wednesday in Cambridge and Boston where he attended to his archival duties and to his work at the Massachusetts Historical Society as John Langdon Sibley Editor of the Graduates of Harvard College. Shipton, in addition to all his other functions, at night at home wrote volumes four through eighteen of Sibley's Harvard Graduates, covering the years 1690-1771. Shipton's contributions to the Society were significant and substantial. During his first years here, he reorganized the collections of post-1820 materials, removing them from the old alcove arrangement to a classified system, although the scheme that he devised has proved to be needlessly eccentric. Each day each staff member had to perform a stint of assigning call numbers to a set number of books. He then undertook the completion of Charles Evans's final volume, from the letter N in 1799 through 1800, which was published in 1955. In the same year he began the filming of the Early American Imprints: First Series, 1640-1800(Evans), with Albert Boni's Readex Microprint Corporation as the publisher of the microforms. Surely this has been one of the most important projects ever undertaken to provide resources for American historical scholarship. Shipton finished this series, which is based on the Evans bibliography, and without pause plunged in the second series, which is based on the Shaw and Shoemaker lists. The series was first issued in an opaque microform, and later reformatted to microfiche. The first installments of a digital version will be issued during 2002. Shipton had completed the year 1805 at the time of his retirement. He left AAS in midafternoon on August 31, 1967, carrying his green Harvard Law School book bag, without saying goodbye to anyone, leaving a tradition of exceeding diligence, devotion to scholarship, and probity. With typical determination and sense of duty to AAS, Shipton, before his death in 1973, completed an index to the Society's Proceedings, which was published in 1978. The relations between Brigham and Shipton were vexed, to say the least. One can hardly imagine two more different personalities. Brigham was a bon vivant, with a reputation in the book world as one who enjoyed earthy pleasures to the utmost and an expert and famous builder of martinis. Shipton was ascetic and a teetotaler. If Brigham was lax in some attitudes, Shipton was rigid. Probably not too long a time passed before Brigham came to regret the understanding that Shipton was to succeed to the directorship. He stayed on, long past his prime, while Shipton doggedly waited him out, terribly frustrated, during his own best years. It was not a happy situation into which Marcus A. McCorison walked on the first of August 1960. During the Brigham and Shipton years there were several staff members whose importance to the Society must be recorded here. We have alluded to Mary Robinson Reynolds, who held, almost, the entire history of the Society in her own memory when she retired in 1941, at age eighty, having served the Society for sixty years. Emma Forbes Waite came to the Society in 1907 and worked effectively with the graphic arts collections until long past her official retirement. Avis G. Clarke came to AAS from Brown University in 1927 as our first professionally trained cataloger. Her intelligence and determination established standards for analyzing the scholarly usefulness of historical documents and for recording the progress of American printing that are still followed and that are not surpassed elsewhere. Miss Clarke retired in 1970. Dorothea Nourse Spear was a highly useful assistant to Mr. Brigham until her death, while still in office, in 1959. She had been on the staff for thirty-five years and had done a good deal of research and editorial work for him. Mary E. Brown, a recent high school graduate, came to the Society in 1937, along with several other excellent people, to work on bibliographical projects that were funded by the federal Works Progress Administration. Mary Brown stayed on until her retirement as head of readers' services in August of 1978. She was tenacious in her pursuit of the right book for the right reader, just as she was in tracking down the lost book that had been misshelved. A bright and cheerful woman, she maintained order in the reading room, and she, too, made valuable contributions to the historical enterprise. Under the leadership of McCorison, director or president from 1967 to 1992, the Society's services to scholarship and the resources and staff to support them were expanded greatly. A fellowship program was established in 1970 (first implemented during 1972-73) and the Program in the History of the Book in American Culture in 1983. Our research, publication, and education programs were initiated or expanded. The bindery was professionalized and turned into a conservation laboratory with McCorisons appointment of Richard C. Baker as chief conservator in 1982. Kenneth Desautels, who had worked in the bindery since the mid-1950s, continued on as Bakers bench mate. An office addition to Antiquarian Hall was built in 1970-71 and the Goddard-Daniels House became part of our facilities in the spring of 1982. The staff grew from eighteen members to forty-five. In 1967, the endowment was $1,500,000; in 1992, $21,000,000. The Society is governed by a Council of twenty-four individuals, who appoint the president of the Society and who advise and consent to Society policies and programs. Officers and Councilors are elected by the members of the Society, who now number nearly 800 persons and who come from many states of the Union and from abroad. Members are elected by their colleagues in recognition of scholarship, for support of cultural institutions, for manifest interest in bibliographical matters, or for distinction as community or national leaders in humanistic affairs. Membership in the Society bears an aspect of honor, but in fact members hold the primary responsibility for the well being of the institution. The 2012 online exhibition the American Antiquarian Society, 1812-2012: A View at the Bicentennial provides a rich, textured overview of the people, buildings, access, programs, research, scholarship and collections of the first 200 years of the Society. In Pursuit of a Vision celebrates the generosity and farsightedness of some of the many collectors, book dealers, and librarians who have, each in his or her own way, contributed to the greatness of the American Antiquarian Society.